From my high school bowling team days and on. 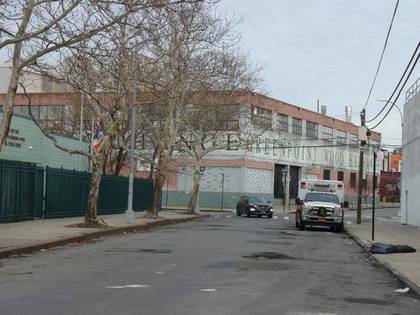 Greenpoint, dubbed the “garden spot of Brooklyn,” by the neighborhood’s longtime alderman (today, a City Councilman) Peter McGuinness, rests at the borough’s northernmost point; Queens’ Long Island City is just a short skip over Newtown Creek. 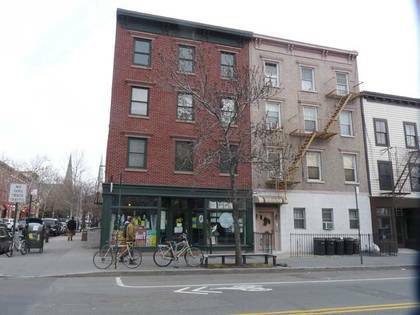 I almost lived in Greenpoint once, back in 1982, when I naively took an apartment on 193 Green Street for $275 a month. My girlfriend’s address at the time was 931 Newkirk Avenue in Flatbush. Synergy! In the first week, I almost fought with one of the local toughs, and I grew tired having one electrical outlet in the whole apartment and having the bathroom in the kitchen. I repaired back to Bay Ridge, and the girlfriend was soon gone anyway. Then as now, Greenpoint was a Polish/Hispanic enclave, with the line of demarcation being Greenpoint Avenue, which cuts the neighborhood in twain. Despite the neighborhood’s encroaching gentrification, Greenpoint’s Polish seem stronger and more entrenched than ever. Greenpoint preserves its ghosts well. Riding on a bus in about the same era when my friend lived on Oak Street, I spied a stenciled sign on a second-floor window: “Preston Hazlewood, attorney at law.” This was from back in the days when they still named people Preston Hazlewood. Greenpoint’s street layout, as well as that of Hunters Point in Queens across Newtown Creek, is the work of industrialist Neziah Bliss, a protégé of Robert Fulton, who was an early steamboat pioneer and owned companies in Philadelphia and Cincinnati. Settling in Manhattan in 1827, his Novelty Iron Works supplied steamboat engines for area vessels. By 1832, he had acquired acreage on both sides of Newtown Creek, in Greenpoint and what would become the southern edge of Long Island City. Bliss laid out streets in Greenpoint to facilitate the riverside shipbuilding concern (street names reflect Greenpoint’s industrial and importing businesses, with names like Box, India, and Java) and built a turnpike connecting it with Astoria; he also instituted ferry service with Manhattan. 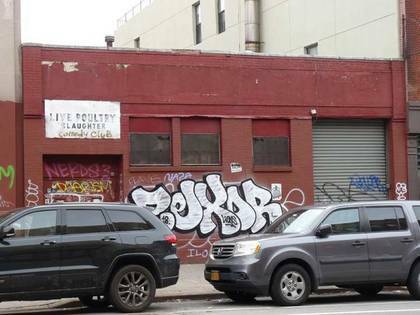 Though most of Bliss’ activities were in Greenpoint, he is remembered chiefly by Blissville and by a stop on the Flushing Line subway (#7) that bears his family name; 46th Street was originally known as Bliss Street. In the 21st century, Greenpoint remains an off-kilter Brooklyn small town, with quirky residents, plenty of Polish delicacies, and a unique perspective, despite the efforts of the Bloomberg and de Blasio administrations to homogenize it with water-facing glass condo towers. Greenpoint Avenue, as you might infer, is the neighborhood’s chief east-west artery. It runs from the East River across Newtown Creek into Queens, where it becomes Roosevelt Avenue and runs under an elevated train deep into Flushing. 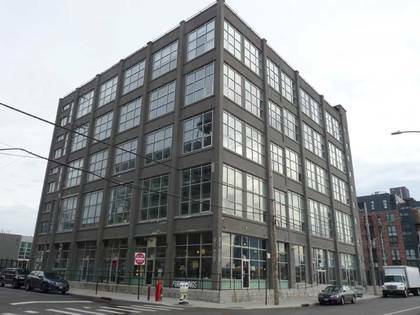 The stretch between Manhattan Avenue and Franklin Street in 2018 is dotted with new restaurants, landmarked buildings, banks, catering halls, and this former slaughterhouse, the former New Lee’s Live Poultry Market. Until a few years ago, the stench of live and newly slaughtered fowl destined for area dinner tables permeated the center of the block. It wouldn’t surprise me if a comedy club did indeed move in and simply white over the S in SLAUGHTER. The old sign is fading but I hope it never disappears completely. Three doors down, the former Polonaise catering hall is now home to a fried chicken joint and a flea market. Eberhard Faber, the scion of a Bavarian pencil producing family, arrived in the USA from Germany in 1848, and after his first Manhattan factory burned down in 1861, he relocated to Greenpoint in 1872; the Faber company moved to Pennsylvania in 1956. 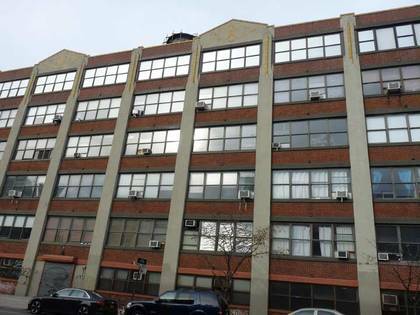 The manufacturer is recalled by a large sign facing the East River painted on its original building at 37 Greenpoint Avenue at West Street, and by the huge yellow terra cotta pencils on its newer Art Deco building next door at Franklin. The pencil factory itself, on Franklin Street, is recognizable by a distinctive yellow star-in-diamond symbol. 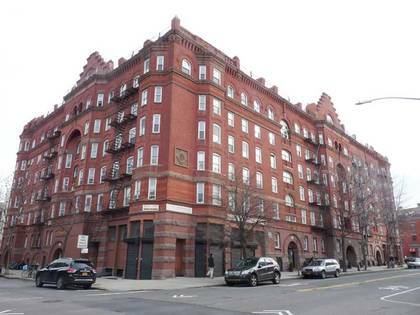 Other Faber holdings in the area can be recognized by the symbol, and they have been granted protected status by the NYC Landmarks Preservation Commission. Word Books, at Franklin Street and Milton Street, is judged by some aficionados as the best “independent” bookstore in Brooklyn. It has an excellent New York City section, at any rate. I have spoken here twice, first to plug Forgotten New York (the book) in 2007, and the second time to assist author Kate Christensen, whose 2011 The Astral: A Novel was based in Greenpoint; I provided a Powerpoint show of “forgotten” Greenpoint highlights, such as the former Greenpoint Villages, a diorama exhibited by a Vietnam veteran on Herbert Street. On the left side of the photo, you can see Greenpoint’s “Twin Towers”: the steeples of St. John’s Lutheran and St. Anthony of Padua Roman Catholic Churches. Van Morrison recorded an album I’ve never heard but which inevitably winds up on all the critics’ Top Ten, Astral Weeks, and a band I have heard, Nektar, had a minor hit with Astral Man in 1976, but undoubtedly Brooklyn’s claim to Astral fame is this handsome, distinctive apartment building built in 1885 as living quarters by Charles Pratt for workers in his Astral Oil Works. Astral Oil’s slogan was, “the holy lamps of Tibet are primed with Astral Oil.” Largess from the oil works was later used to create Pratt Institute, one of NYC’s most prestigious art schools, in Clinton Hill. Astral made Pratt a multimillionaire, but he later sold it to a bigger one, John Rockefeller’s Standard Oil. In 1911, Standard was found to be in violation of the Sherman Antitrust Act; the shards of Standard became Esso (Exxon), Chevron, Mobil, and other companies. The Astral takes up the entire block and has nearly a hundred apartments. Its distinctive three-sided bays, arched entrances, and recessed arch reaching the fifth floor are rare features; a center courtyard admits air and light to all apartments that don’t have a front exposure. Seekers of beautiful architecture visit Greenpoint’s India, Kent, Milton, and Noble Streets for their concentrations of classic 19th-century buildings. But my favorite cross street in Greenpoint is Oak, which also has its moments. In the 1980s I had a number of friends in Greenpoint. My friend Gary spent much of his youth shuttling between Greenpoint and Flushing. In the early 1980s, he and his girlfriend, later wife (now divorced) Alison had the front apartment at 135 Oak, seen here on the right. The place was magical for me. That polygonal bay window looked out over the L-shaped intersection of Oak and Guernsey (one of the few such intersections in NYC). In one of the back rooms, if you cocked your head at a certain angle, the Empire State Building showed up. Alas the couple was only here for about a year before going back to Flushing; today, Gary is in Atlanta and Alison has bounced around out west, from Alaska to the Southwest. I would have liked to take over the apartment. 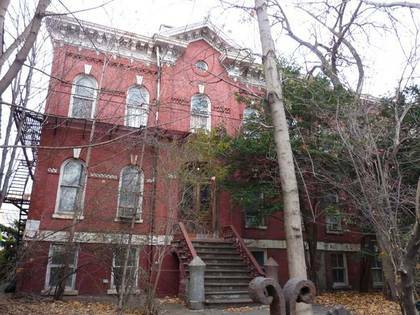 Right next door, at the angle of the intersection, is one of Greenpoint’s most forbidding buildings, the former Greenpoint Home for the Aged, which was constructed in 1887 by architect Theobald Engelhardt at the behest of former New York Governor Samuel Tilden, who owned a lot of Greenpoint property and decided to put some of his holdings to good use. At first, 137 Oak Street was a home for indigent women, then became a home for the aged; since 1967, it has been a boarding house or SRO. Its current status is a mystery, and its current occupants zealously guard their privacy. West Street below Greenpoint Avenue is largely tamed now, as seen here in this former factory building, but until recently it was Greenpoint’s Wild West, with hulking factories connected by flimsy, rusting bridges crossing West Street. It was home to NYC’s last remaining sidewalk made from wood blocks, on its west side. Only recently has this fire hazard been removed and concrete poured in. This stretch has been the scene for plenty of movie shoots, but I best remember 1993’s Romeo Is Bleeding, in which a mobster played by Lena Olin attempts to strangle crooked cop Gary Oldman with her legs. They crash into a lamppost, and Olin crawls out in her underwear and stalks down West Street while a dazed Oldman staggers out of the wreck. That scenario probably played out in real life dozens of times. Before the 1970s, Greenpoint was just lines on a map for me. I had never been there. Then I joined the high school varsity bowling team and once a week we traveled to a bowling alley in Greenpoint where Cathedral was duly whomped by St. Francis Prep, Chaminade, and every other school on the schedule. We would pile into a van with our bowling balls in bags, and ride from Washington and Atlantic up Kent Avenue and east to the alleys. Sometimes, though, the van was unavailable or under repairs and we’d schlep the four blocks to Lafayette and board the G train, getting off at Greenpoint Avenue, where we would walk a few more blocks east and south to Humboldt and Meserole. I think the current Greenpoint Wood wholesaler occupies the site these days. Repeat in reverse after we lost, but on those days we took the train, I took the G to Smith-9th, where I had to change to the F, take it one stop and make another transfer to the R train back home to Bay Ridge. Dedication! 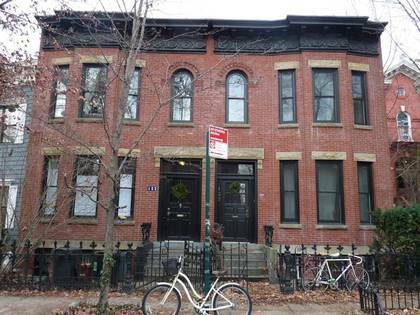 To get a handle on the pulse of Greenpoint, check out this website where my friend Miss Heather chronicles the week’s activities on Manhattan Avenue, which she calls the “Boulevard of Dreams,” and elsewhere in the Garden Spot. Where Have My Old Friends Gone?